We are now two novels, a bunch of short stories, and a few audio dramas into the new Age of Sigmar setting. How does War Storm, the first full book in the setting, compare to the quality we have come to expect from Black Library? War Storm is actually three novellas compiled into one novel, so instead of reviewing the whole thing I will briefly go over each story on it's own. I also give each story it's own score and a final overall score at the end. The individual scores are graded off of how they compare to each other, otherwise they would probably be even higher. Borne by the Storm picks up pretty much where we left off at the end of The Gates of Azyr. Vandus and the Hammers of Sigmar have now secured their beachhead on the Igneous Delta and have started to advance towards Khul's fortress. The events of the plot follow what happens in the Age of Sigmar big book almost down to the letter, which isn't really a huge surprise. We do get to see different perspectives on certain events though, as well as some stuff that happened "off screen" in the big book. The four main characters we follow are Vandus Hammerhand, Ionus Cryptborn, Khorgos Khul, and Jactos Goldenmane. Vandus and Ionus split up, dividing their forces to approach the Chaos stronghold from two different directions. Ionus is the most interesting to me, mostly due to his back story with the Realm of Death. It turns out he isn't some super secret guy from the Old World like I was hoping (like Vlad for instance), but instead a former noble from the Realm of Death. We get some interesting flashbacks from him as well as a few interactions with a voice he hears inside his head which I strongly believe is Nagash. The whole interaction between the Stormcast and Nagash, with the Relictors in particular, is really fascinating to me. By their very nature they are defying him as the god of Death and he isn't too happy about it. I'm really excited to see Ionus' story expanded further as the story moves on. Meanwhile Vandus is plagued by visions of his own death at the hands of Khul. The majority of Vandus' story in this has more to do with his interaction with his fellow Celestant, Jactos Goldenmane. Where Vandus is patient and tempered, Jactos is brash and headstrong. Both are very competent fighters and leaders, but Jactos' nature sees him falling into easy traps more often then not. We see a lot of discussion about what it means to truly be eternal, and whether or not any of them really believe it. It's a point I hadn't thought of since at this moment in the story, none of them have died and been reforged yet. They are essentially taking the fact that they are eternal from Sigmar at face value and just hoping that it's true. As we learn throughout this story, there are exceptions to the rule, to the detriment of the Stormcast. Khul's story is also interesting in that at the end of The Gates of Azyr he had been left for dead by his own forces during their retreat. He comes around lying in a pile of dead on the battlefield, mistaken for a corpse by the Stormcast. Now he must make his way back to his stronghold across the Igneous Delta and through the challenges of rival leaders. Another great element of it was the description of the realm. This is something that is left pretty vague in the campaign book. Here we get to see that the Igneous Delta isn't just all fire and brimstone. There is in fact forests and mountains capped with snow. I'm really glad they made sure to include these descriptions since it allows the land to feel more like a place that can be lived in, not just fought over. There was never a dull moment in this novella, and it also never felt like action for the sake of action. I would say it leaned a little more towards the action movie side of things, but it balanced everything very well. Vandus and his compatriots could run the risk of coming across as bland and boring since they are the poster boys for the Stormcast, but they are fully fleshed out characters with plenty of depth to be explored and I definitely look forward to reading more about them. The second story in the collection follows Thostos Bladestorm and the Celestial Vindicators in the Realm of Metal. It actually opens up with a flashback to when Thostos was still just a mortal and how he first "died". I find these peaks into how the people and realms operated back when Chaos was just beginning its invasion really intriguing as it's completely different to how they operate now with Chaos in control. From there we go back to the present with Thostos leading his warriors though what appears to be a desolate realm. I really love the descriptions of the Hanging Valleys of Anvorok since they are so fantastical. What really makes it for me though is how even the Stormcast think this realm is a little wonky. All of the realms are clearly more high-fantasy then the Old World ever was to start with, but it appears that Chaos has really done a number on them in the time that Sigmar has been gone. There is what appears to be an actual gigantic space dragon hanging around the realm, not just an analogy. At first I thought this kind of stuff would pull me out of the setting a bit, but with the way it's being handled I actually really, really like it. The door is pretty much open for the writers to do any fantastical thing they want, which gives them so much more freedom. The events of the plot follow what happens in the campaign book just like the last story, but it's still interesting. We get to see a bit more of the realm and the Duardin ruins that surround the hidden Silverway portal. The portal itself is pretty cool and I see it playing a fairly large role in the Realmgate wars going forwards, especially since it seems like the next campaign book might be the battle for the Allpoints. The Silverway essentially allows you to safely travel to any of the realms, but it's a one way ticket, and if you want to return you need to find a different route. There are some cool descriptions of what it's like to travel through it. Thostos himself is a little headstrong, and tends to want to rush into battle. This is a trait of all of the Celestial Vindicators, and they chafe a bit at the idea of being tasked with finding the Duardin instead of being sent into open battle. Luckily for them battle finds them soon enough when Ephryx, a Tzeentch sorcerer lord, attacks them. This character is also pretty intriguing, as he is trying to transport the entire Realm of Metal into Tzeentch's domain in the Realm of Chaos. He sees the Stormcast as a source of great magical power if he can harness their energies when they die. 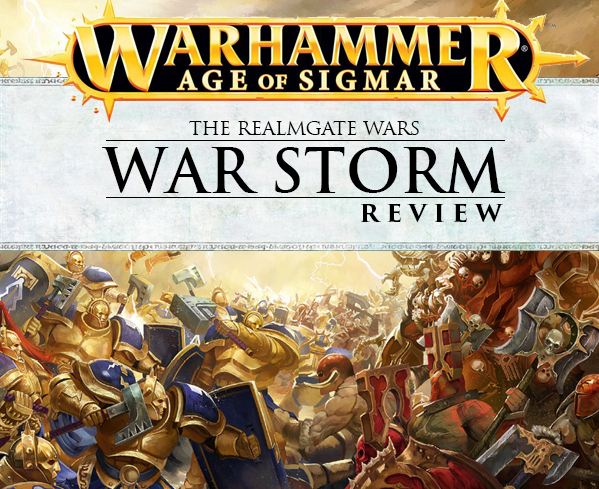 The entire Chaos dynamic is actually really great in the Age of Sigmar since they are no longer the invaders. They are now the established power, the ones with fortresses to defend, and claims to the land the Stormcast are trying to liberate. Thostos at one point brings up an interesting philosophical question in that can you really blame a lot of the warriors they are fighting for siding with Chaos? They were born into it and had no other choice but to serve Chaos or die. This is a pretty big departure from what we were used to in the Old World where it was almost always a matter of choice. This story is paced really well, with the mix of action scenes and quieter moments finding a nice balance. Guy Haley has a continuation of this story in the next book, Ghal Maraz, which I am now even more excited to read. That story should contain Vandus and Ionus as well. It appears that Vandus will be the Loken or Erebus of the AoS setting, with pretty much every writer getting a chance to use him in their story. The final novella in the book is The Gate of Dawn by Josh Reynolds, who seems to be the most prolific writer for Age of Sigmar so far. This one is really fast paced compared to the other stories with little to no build up before the action starts. We get a little prelude to the battle with a Blightking of Nurgle organizing some sort of ritual around the Gate of Dawn, a realmgate that is supposed to lead to Aqshy. However, within the first chapter the Stormcast strike and the action never lets up from there. I was honestly a little curious on how this was going to fill up the whole novella since I knew how it would end from having read the campaign book. Despite this the battles are gripping and never bore you and we do get a little break from the fighting here and there. While Gardus is leading his Warrior Chamber against the forces of Nurgle in Ghyran, Zephacleas, a fellow Lord-Celestant of the Astral Templars, is still in Azyr worrying about his friend. It's nice to see this kind of humanity showing through since sometimes the Stormcast run the risk of coming across as a little too superhuman. Zephacleas is in Sigmaron, the city that orbits the core of the World that Was and the Stormcast's home base. This allows us to see a bit of how that city functions, which I would love to see more of. Once Sigmar senses that the battle is going poorly in Ghyran, he summons Zephacleas and his warriors to lend aide. Did I mention the reason that the battle was going poorly was because the Gate of Dawn no longer works properly and instead now leads into Nurgle's domain? A gigantic Great Unclean One named Bolothrox pushes his way through and summons an unending horde of Plaguebearers and Nurglings. He also has his personal retinue named the Rotguard which consists of seven other Great Unclean Ones. It's no wonder that Gardus was having a tough time of it. Even once the Astral Templars come to their aide it appears like the forces of order may still lose, and the entire rest of the story is an uphill battle for them. Gardus gets some nice character moments with flashbacks to his mortal life. It appears like each Stormcast remembers a varying amount of their life, with Vandus having a near perfect memory, while Gardus can barely remember anything. I really like this dynamic and am excited to see what else they do with it going forward. From Thostos we have already seen that they run the risk of losing even more of their humanity and memories each time they are reforged. Josh Reynolds also has a direct follow up to this in Ghal Maraz which I'm pretty hyped for. Out of the story arcs in the Ghal Maraz campaign book, the one in Ghyran featuring Gardus was the more gripping of the two. I'm always excited to see what Josh does with iconic characters and if he covers a lot of the same ground as the campaign book then we should see the Glottkin, Gutrot Spume and maybe even Alarielle. That's not even mentioning the cool settings he will get to explore. If you are interested in the Age of Sigmar lore at all I highly recommend picking up this book. The quality of writing in this is just as good as anything for 40k, and for me, a little more interesting. This probably has a lot to do with the unknown factor. There is so much we don't know about AoS yet so when you are reading it you are often discovering stuff for the first time. It's something I would compare to when you first started reading anything for the Games Workshop universes, or when the Horus Heresy series first came out. There is so much to explore and revisit from different viewpoints that I don't see anything stale coming out for AoS for a very long time. It's also worth mentioning that the production quality of the book is fairly high. The book has a flat spine which gives it a nice boxy look. The paper is thicker then normal, which lends it some weight. This isn't to pad out the thickness of the book either since it comes in at a normal page count for a full novel. There is also a stylish and handy black ribbon to mark what page you're on. This is a fairly unexpected, but welcome addition considering the $24 price, which is that standard for a hard cover Black Library book that's not Horus Heresy.